Our exclusive USSVI Insignia Flasks are far more than a simple scan of a patch. We have taken the original graphic and completely re-drawn the insignia from scratch. Careful attention has been taken to accurately create this new exclusive artwork in brilliant color at the highest quality possible. You won't believe the clarity of the image. These 6oz. Stainless Steel Flasks slip easily into a pocket. This popular product has been improved by replacing the hinged top versions with a simple stainless steel screw-on, removable cap. Made from high quality, food-grade stainless steel, our flasks do not contain BPA or any other toxins. 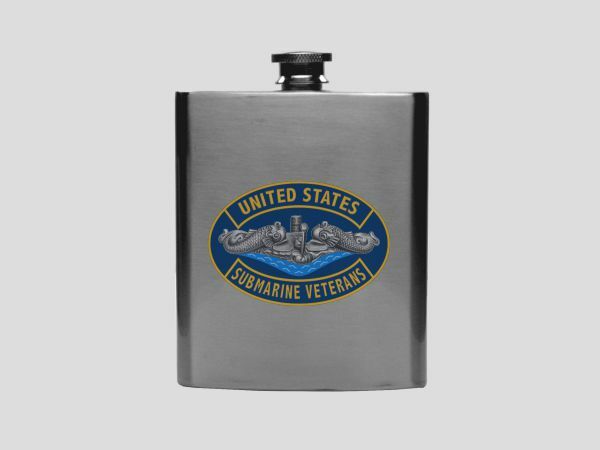 We custom print each Submarine Flask to order in Cumberland, Maryland.